Give a voice to the voiceless. TalkRocket Go is the family-friendly communication aid that helps people with Autism, Cerebral Palsy, Stroke, Traumatic Brain Injury, Parkinson’s (and many others) speak out loud. Just tap to talk. A simple, engaging design for all ages. With TalkRocket Go, you can start talking right away, no training required. Oversize buttons make good targets for fingers big and small. Bright, friendly colours encourage participation. Large, high-contrast text is easy to read. And vivid, personalized pictures make the perfect visual symbol. 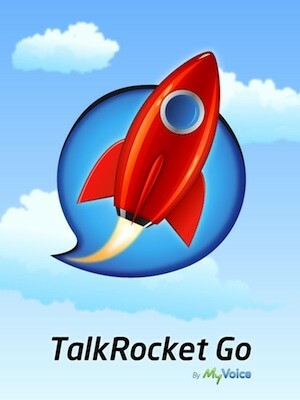 TalkRocket Go makes talking as easy and fun as, well, talking. Add, edit, or delete any phrase or picture in seconds. Quickly create the vocabulary that fits you. Add your own phrases with one tap. 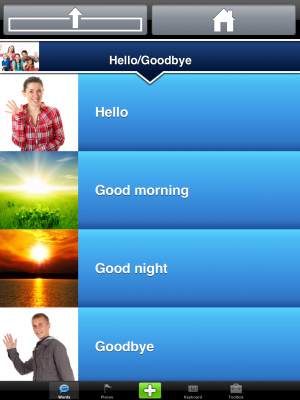 Enhance vocabulary by snapping a picture or choosing any photo in your gallery. Use the Toolbox to edit or delete anything you see on screen. There’s no “programming” – editing happens right before your eyes, so what you see is what you get. And when you’re happy with the results, turn on the optional lock to prevent changes. TalkRocket Go gives you the tools to express anything. What you say is up to you. 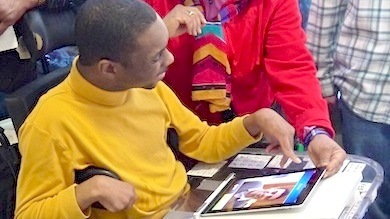 The best switch, button, wheelchair, and scanning support leaves no one behind. TalkRocket Go comes with comprehensive support for Bluetooth switches, buttons, keyboards, and wheelchair interfaces. 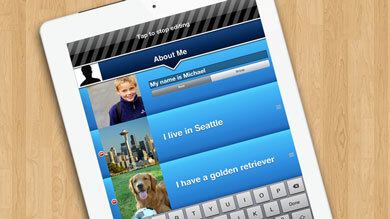 Combined with your choice of automatic or step scanning, it’s the ultimate in AAC accessibility for the iPad. Pick from six distinct highlight colors. Set the speed from slow to fast. 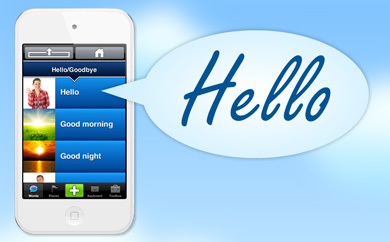 And buying special hardware is optional too – TalkRocket Go can turn the whole device into one huge button. Users who struggle with accuracy can activate the screen with their whole arm. Users who have muscle weakness can use the lightest touch of a pinky finger. Finally, kids and adults with complex physical challenges are included too. 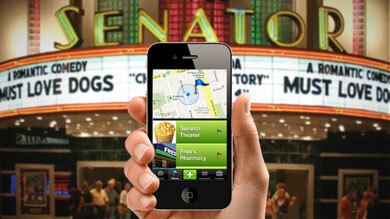 TalkRocket Go makes it easy to communicate wherever you are. Add your own Places – vocabulary groups that jump to the top of the list based on GPS. At a movie theatre, get phrases to order tickets. At the coffee shop, your favorite drink. At school, the names of your classmates. Other AAC products make you hunt through your whole vocabulary to find the right words. TalkRocket Go helps find the phrases you want, where you need them. Become a support superhero with the ultimate online editor. Say hello to a free online tool that lets you support users from your web browser. Supporter Studio provides a wireless editing interface that’s just like being in front of a user’s device. 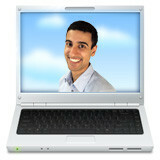 Changes sync instantly over wireless Internet, so you can support someone from across the country. You add it here, they see it there. They change it there, you see it here. And you can say goodbye to plugging in cables and doing backups – Supporter Studio automatically saves your hand-crafted vocabularies for safekeeping. At just $129, it’s financially accessible too. 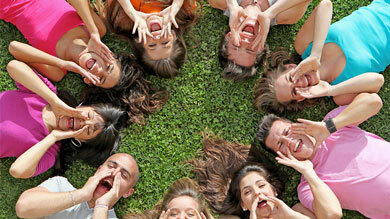 TalkRocket Go is the most affordable communication aid in its category. It costs up to 75% less than many apps with fewer features. And even with the price of an iPad, it’s just 6% of the cost of outdated, $10,000 hardware devices. In fact, TalkRocket Go on an iPad is often even cheaper than the warranty. But being affordable doesn’t mean settling for less. Amazingly, TalkRocket Go has far better features and services than several more expensive products. So you get a communication aid that’s not just accessible, it’s within reach. For people with speech disabilities, there are many barriers to communication. But language shouldn’t be one of them. 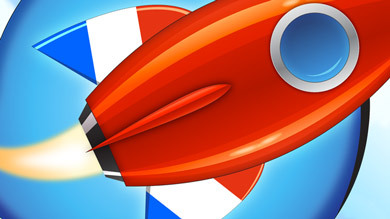 That’s why TalkRocket Go is available in French, with many world languages coming soon. Great, simple app for people who know more than they can say! I have already shared the app’s concepts with several colleagues. 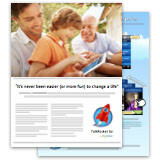 It is easy to navigate and I love the way the buttons are customizable with personally relevant photos. Wonderful! Thank you does not quite cover it. This app delivers features lacking in every other aid I have seen. It’s easy to use, great for all ages. As a parent of a teen who is non-verbal with complex motor challenges, this is the first AAC solution I have seen to help her. After ten years of silence and struggling to be included in regular activities, my child can now do an oral presentation in class. 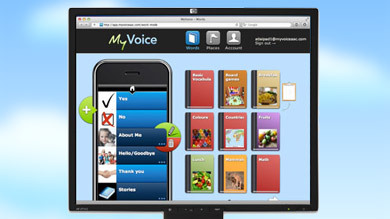 This is a game changer that has set the bar so high for AAC apps. A grateful parent of a beautiful girl who has things to say and now can.